When asked to build the facility spaces for the Ruskin School of Art in Oxford, Spratley & Partners Architects resolved to give a more public face to the school, minding to provide the students room to work. Designed for the launch of a new Masters of Fine Art Programme, this building was doubled in size by a clever use of the site, accommodating more students inside, while providing them with the facilities to host their own public exhibitions and performances. To complete the structure, Spratley & Partners worked closely with audio visual design consultants to intertwine high specification and multifunctional AV systems into the very fabric of the building. Will Scott documented the school in a short film, "Ruskin School of Art", confirming his distinctive quiet and sophisticated tone, noticeable from the long shoots to the choice of the soundtrack. Scott portrays a day in the life of the school: it's a spring day in Oxford and the students are gathering in the halls of the school. Here, the use of white walls and white ceiling is a striking feature: all the different rooms look neat and full of air. This also gives the students the possibility to create mini studios, by using removable booths. Scott's camera shows canvases, brushes, garments left here and there by the students, painting hanging on the walls, wooden structures awaiting their craftsmen, while, somewhere else, an art class is beginning, with people attending sat or standing around their teachers: this artisanal vibe recalls the old masters' bottega concept. 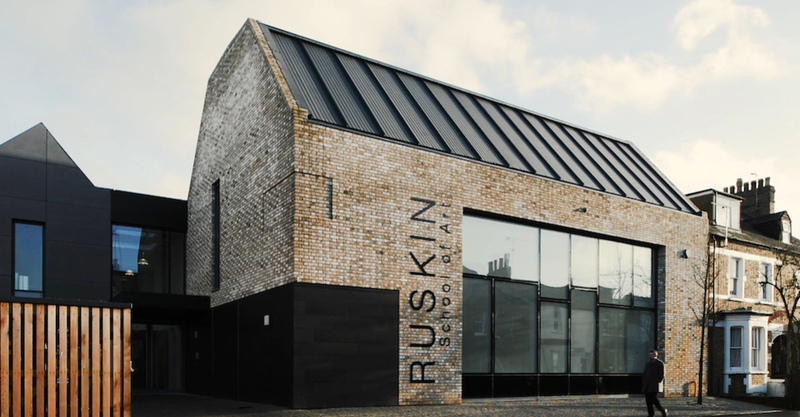 Nevertheless the Ruskin School of Art is a fully equipped academy: we see technological devices, machinery and printers gathered in the rooms, which make it a leading example in its field. Will Scott, then, highlights the key feature of the building: the public-facing double-height exhibition area, which has a frontage fitted with interactive glazing. Creating great visual impact, the glass can be used as one giant screen or as individual panels; in the video it greets us with a colourful hello world!. At night, screens are switched off and the glass becomes clear, allowing the building to quietly integrate into the surrounding area.